Once you learn how the pick and roll should be run and fix up a few mistakes, your team’s pick and roll will be far more effective resulting in improved scoring opportunities. 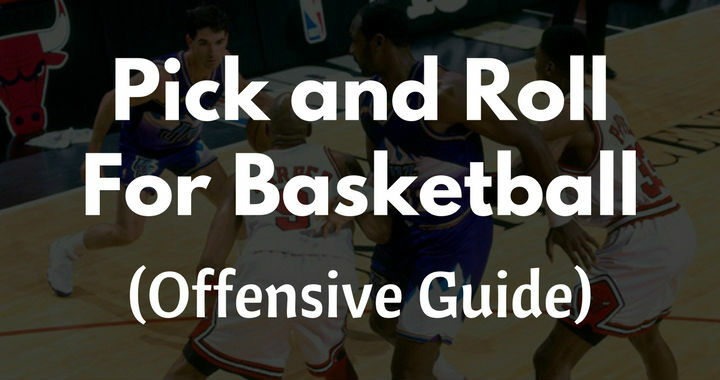 In this article, I’ll explain what a pick and roll is, break down the perfect 7-step process that will have your team shooting wide open shots and layups, share drills and plays with you, and much more. Let’s establish some base knowledge on how the pick and roll works with a simple breakdown before diving into much more detail. The pick and roll (also known as the ‘screen and roll’, ‘on-ball screen’, or ‘ball-screen’) involves an offensive player setting a screen for a teammate in possession of the basketball. 1. An offensive player without the basketball sets a screen for the player with the basketball. 2. The player with the basketball reads the defenders and dribbles off the screen looking to attack and create a shot for themselves or another player on the team. 3. 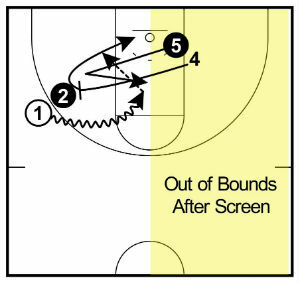 After screening, the screener rolls to the rim looking to catch the basketball and finish inside. Looking for more advanced information? To make the pick and roll simple and easy for your players to learn at an advanced level, I’ve broken it down into 7 easy-to-understand steps. The first three steps focus on the preparation for the screen which is the most important part of the pick and roll. If this isn’t done properly, there’s very little chance the pick and roll will be successful. 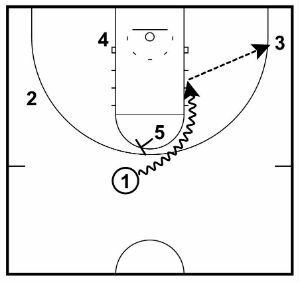 The final three steps focus on the execution of the pick and roll. These require the offensive players to read the defense and make the correct decisions based on how the screen is defended. The first step for an effective pick and roll is for the dribbler to create separation between themselves and the on-ball defender. This sets up the on-ball defender to be screened effectively. If the on-ball defender is too close, then it will be easy for them to lock on and trail over the screen without being put at too much of a disadvantage. To create this separation, the dribbler should sweep through or jab step if they haven’t used their dribble. If they are in the process of dribbling, a quick jab and crossover or inside-out dribble will be enough to make the on-ball defender take a step back in preparation to defend the drive. The second step to an effective pick and roll is for the screener to create as much separation as possible between themselves and their defender before setting the on-ball screen. By creating separation before setting the screen, we decrease the screener’s defender’s ability to provide help on the dribbler. Without good help, the dribbler is often open for the shot or will be attacking a defender who is still closing out to the basketball. So, how can a screener create this separation? By giving away where you’re going to screen, the opposition is able to establish correct defensive position early and communicate with other defenders. It’s also important that coaches implement an offense that doesn’t involve the same screens being set over and over again. (I recommend: 5-Out Motion and 4-Out 1-In Motion). This is another reason why it’s not a good idea to run the same set plays constantly throughout a game. When an offensive player is going to set the screen, they should explode towards the position of the screen to get an extra step or two on their opponent. In fact, smart players are able to nudge their opponent off-balance (without committing an offensive foul) before exploding to the ball to create further separation. Too often we see screeners casually jogging (or even walking) towards the screening position allowing their opponent to establish help position early. The ‘ram screen’ is a great basketball action which involves a third offensive player setting a screen for the screener before the screener sets the on-ball screen. This might be difficult to understand through words, so I’ve included this great video from Dan Carbaugh on the ram screen. 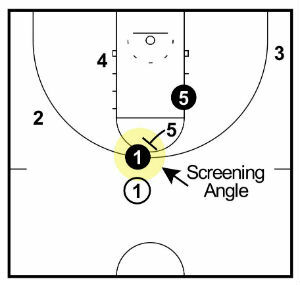 Since the screener’s defender is being screened, it will take them more time to get to the correct help position as they’ll have to fight through the first screen. 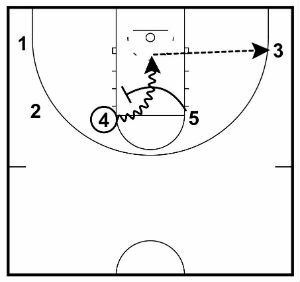 Again, this gives the dribbler a head start attacking the hoop and the screener’s defender must stop the dribbler while they have a full head of steam. This can be incredibly effective if you’re able to incorporate it into your offense. The angle that the screen is set on is arguably the most important part of the pick and roll yet is often overlooked by most coaches. If you take anything at all from this article, let it be that you focus more on the angle your players are setting on-ball screens. It’s one of those small details that can lead to big results on the court. So, what’s the correct screening angle? Players should be setting the screen on the back hip of the on-ball defender. This will force the on-ball defender to fight over the screen and will lead the dribbler in the direction of the basket. Most of the players I currently see at a youth level will set the screen with their back facing the sideline. This isn’t effective as it allows the on-ball defender to slip under the screen and re-establish position quickly. The correct way to set this screen would be with their back facing the corner of the court. This makes it difficult for the defender to slip under the screen and will give the dribbler (and offense) a big advantage when attacking the paint to create a scoring opportunity. The final part of preparing for the pick and is for the screener to make contact when setting the screen. This requires them to hunt out the on-ball defender, focus on the correct angle, and then make contact as they set a strong screen. As this screen is set, 100% focus should be on setting a solid screen. I see far too many players set weak screens as they’re too focused on rolling quickly and getting the basketball. The reason making contact is beneficial when performing the pick and roll is that it leaves no room for the defender to maneuver around the screen. If the screen is set a step off and there’s extra space, it’s far easier for the on-ball defender to drop their shoulders and beat the stationary screen. This rule also prevents young players from setting a screen on an area instead of seeking out one of the defenders which can be a big problem for young teams. Once the screen has been set correctly, it’s now up to the dribbler to read the defense and use the screen. When dribbling off the screen, the dribbler must drive by the screener shoulder-to-shoulder and use at least two dribbles to create separation and see how the defense reacts. The dribbler must have an attacking mindset! While we don’t expect the dribbler to drive and shoot every time they use a screen, it’s important to attack as it will force the defense to rotate and open up other offensive players. If an obvious pass or shot appears sooner, players can take it. But in most situations, two dribbles is preferred. Note – It’s crucial the dribbler is patient and waits for the screener to be stationary. The #1 cause of illegal screens is because the dribbler is impatient and attacks too early. Once the on-ball defender has fought past the stationary screen, the screener must then cut to the rim looking to catch a pass and score inside. This involves the screener sealing off the on-ball defender by reverse pivoting using the foot closest to the rim as the pivot foot. 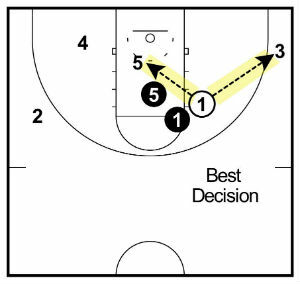 The other option is for the screener to immediately dive to the rim without reverse pivoting. Instead, they turn their back on the dribbler for a split second and simply turn and run to the rim looking for the basketball. The final step of the pick and roll is for the dribbler to read the defense and make the correct decision. This could be to attack the rim, pass to the roll player, or dribble in and kick the basketball out to the outside shooters or players cutting to the rim. Note – The ball-handler must be aware of their teammate’s abilities since this will determine whether they make a good decision. For example, it’s much better to pass to a shooter on the perimeter than a player who struggles from long range. More often than not, it’s the decision in this step that will determine whether your team gets a great scoring opportunity or not. That’s why it’s crucial that you’re putting players in the ball-handler position who have the ability to attack and have a high basketball IQ. As the dribbler is attacking off the pick and roll, it’s crucial they’re able to read the defense and make the correct decision to give their team the best opportunity to score. Splitting the defenders is a great way to attack the rim if the screener’s defender hedges out too far to stop the basketball or attempts a steal. This option involves the dribbler using the screen, planting the outside foot as they see the defender hedge out, and then pushing the basketball through as they explode towards the rim. When doing this, the dribbler must quickly change direction and speed as well as keep the basketball low so that it’s out of reach of the screener’s defender. If performed properly, this action will commonly lead to a layup or a pass out to an open player on the perimeter. If the screener’s defender doesn’t hedge out high and stays attached to the screener, the dribbler must attack the outside hip and drive to the rim. This ensures that the on-ball defender will be trailing the play providing that the screen was set at the correct angle and the dribbler has attacked shoulder-to-shoulder. This is the most common action in the pick and roll and will force the other defenders to help leading to a pass out to a teammate or the dribbler attacking the rim. When the on-ball defender anticipates that a screen is coming, they’ll often attempt to cheat over or under the screen early. If they do, it provides the dribbler with a great opportunity to explode in the opposite direction of the screen towards the hoop. This will often catch the defense off-guard and give the dribbler a 1 – 2 step advantage forcing other defenders to rotate and help. Since this relies on explosiveness, it’s important that the dribbler is down in stance if they want this action to be effective. If the screener’s defender decides to hard hedge on the screen and the dribbler decides not to split, another great option can be to back out a step or two and see how the defense reacts. Due to the separation created, if the screener’s defender chooses to hustle back to the screener, the dribbler will usually be open for the shot or drive. If the defense chooses to switch on the screen, there’s a high chance that one or two mismatches have been created. 1. The dribbler can isolate and attack their new defender one-on-one. This can be very effective if it was a post play who switched onto them. 2. 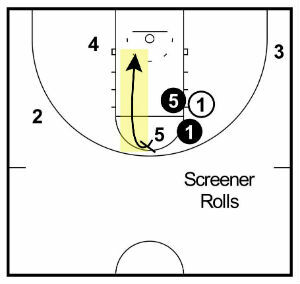 The screener can roll to the rim and post up. This can be very effective if it was a guard who is now forced to defend the screener in the post. Last but not least… shoot! If the on-ball defender decides to slip under the screen and the screener’s defender hasn’t stepped up to help, this can leave the dribbler wide open for a jump shot. If your players can’t make this shot consistently, it will result in the on-ball defender being able to establish front position again. That’s another reason why it’s crucial that teams never allow the on-ball defender to slip under the screen on a pick and roll. 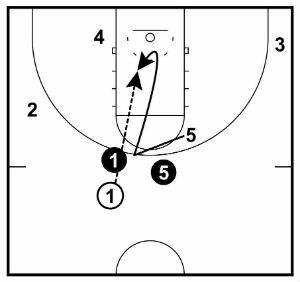 When running the pick and pop, instead of the screener rolling to the rim, the screener pops out to the perimeter looking to receive the pass for an outside shot or catch and drive. This variation is very effective if you have a post player who can knock down the three-point shot at a high percentage. It also helps the ball-handler as it’s difficult for the screener’s defender to provide help due to the threat of the quick pass and open shot. The other variation of the pick and roll is the pick and slip. When running the pick and slip, the screener dives to the rim just as they’re about to set the on-ball screen. This variation is best used when the screener’s defender predicts the screen and helps too early instead of staying between their player and the basket. This is also effective when the defenders attempt to trap the dribbler. Below I’ve listed 11 different types of the pick and roll that coaches should be aware of. I’ll also use this section of the article to show you the positions on the court the three off-ball players should be filling during each variation of the pick and roll. Having great spacing from the three off-ball players is absolutely crucial if you want your team to be effective with the ball-screen. The ‘top pick and roll’ (or high pick and roll) is a ball-screen at the top of the key. When this is run, there will usually be one off-ball player in the short corner and the other two offensive players behind the three-point. The two players behind the three-point line should be on opposite sides of the court. The ‘side pick and roll’ (or wing pick and roll) is a ball-screen set on the wing leading the ball-handler to the middle of the court. When this is run, the other three players will usually set up on the opposite side of the court. One player on the wing, one in the corner, and one in the weak-side low post. The ‘corner pick and roll’ is a ball-screen set on a player with the basketball in the corner of the court. When this is run, there will usually be off-ball players set up at the top of the key, in the corner, and in the weak-side low post. The corner pick and roll is a common action in the Triangle offense. The ‘elbow pick and roll’ is a ball-screen set on a player with the basketball while they’re on the high post (elbow). 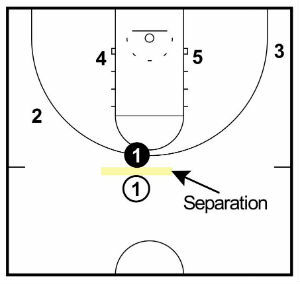 This will usually be performed by two post players with the other three offensive players outside the perimeter to create space inside. This should be utilized by more coaches as it only requires one dribble to get to the basket. 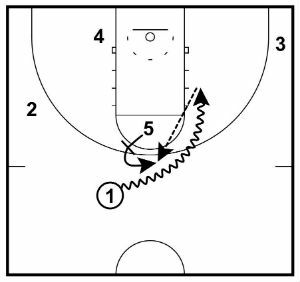 A ‘single drag pick and roll’ is a ball-screen set in transition. This is often effective because the screener’s defender who is meant to play help defense on the dribbler is caught out of position as they’ve sprinted back to defend the basket. This will often result in a clear drive to the rim for the dribbler. A ‘double drag pick and roll’ requires two offensive players setting ball screens in transition. In this variation, the player who sets the first screen (5) rolls to the rim. The second screener (4) pops out to the perimeter. A ‘horns pick and roll’ begins with two offensive players simultaneously setting a screen on opposite sides of the ball-handler at the top of the key. This allows the dribbler to attack either direction and opens up the court as they’re driving to the rim. 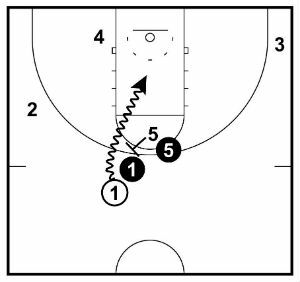 Whichever direction the dribbler elects to attack, the screener on that side rolls to the rim while the other screener pops out behind the three-point line. A ‘flat pick and roll’ is occurs when the screener sets the on-ball screen with their back facing towards the rim. This variation of the pick and roll can be very effective if you’ve got an explosive player who can attack going either direction. It’s also great for catching the on-ball defender off-guard since they won’t see the screen coming. A ‘spread pick and roll’ is a ball-screen action while the three off-ball players are all outside the three-point line. This action is very effective for teams that are able to surround the pick and roll with 3 players who shoot the basketball at a high percentage. This variation makes it very difficult for defenders to help off their player without giving up and open three-point shot. A ‘step up pick and roll’ is a ball-screen set on that wing that directs the ball-handler towards the baseline. The quick step-up from an offensive player in the ball-side low post can be very effective if it catches the defense off-guard. The screeners defender will often assume the screen is being set in the middle so they won’t be prepared to help. The ‘Spain pick and roll’ consists of a regular pick and roll and then a third offensive player stepping up and setting another screen on the defender of the player rolling to the rim. This creates a lot of communication problems for the defense and often they’ll get confused and leave one of the offensive players open. There are many fantastic basketball plays that utilize the pick and roll action to put players in great positions to score. 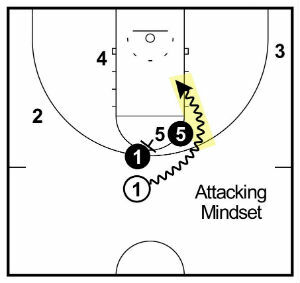 This box set play is designed to get a player attacking the rim off a pick-and-roll with two open passing option in the corners and also the ability to score at the rim depending on how the defense adjusts. Two guards who can shoot the basketball at a high percentage (1 and 2). Another guard who can attack off the pick-and-roll and make the right basketball play (3). 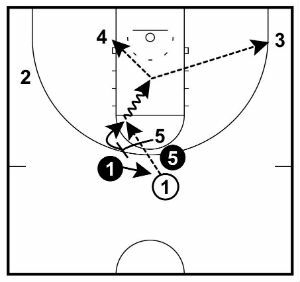 Setup: The play begins in a box formation with 4 and 5 at the top and 2 and 3 on the low blocks. 1 starts out the top with the basketball. 1. 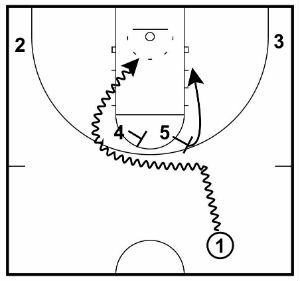 1 starts the play by dribbling the basketball to either wing. For this example, the left wing. 2. The ball-side low block player then cuts high off the screen on the elbow and receives the pass from 1. 3. As this is happening, the weak-side low post player retreats out to the corner to provide good spacing for the next actions. 4. 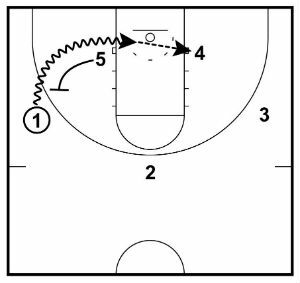 On 3’s catch, 5 immediately steps across and sets an on-ball screen. We want this to surprise the defenders and give them little time to react. 5. 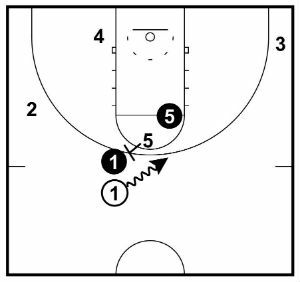 While this screen is happening, 4 beginning the movement to set a hammer screen on 1’s defender as 3 is driving to the rim. 6. 3 uses the screen and attacks the rim looking to score while also having both players in the corners as passing options. Very important that the screen from 5 is set immediately on the catch to try and catch the on-ball defender off-guard. The back screen for 1 must be set as 3 is driving to the hoop. Any sooner and x1 will have too much time to fight over the screen and pick off or deflect the pass. 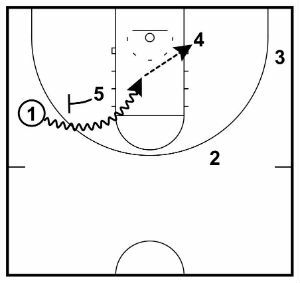 The weak-side corner defender will usually be the one that helps on the drive so 3 must be ready to pass out to 2 in the corner as soon as that happens. A very simple play out of the horns (1-2-2) formation. 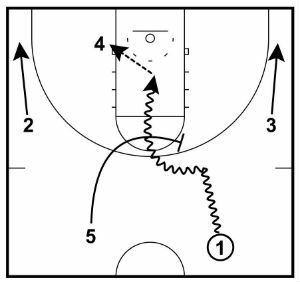 Involves a guard receiving the basketball on the wing and then receiving and on-ball screen. On the opposite side of the floor, there’s a down screen set to keep the defense occupied. 3 should be a good decision maker out of the pick-and-roll. 5 should be the team’s strongest pick-and-roll post player. 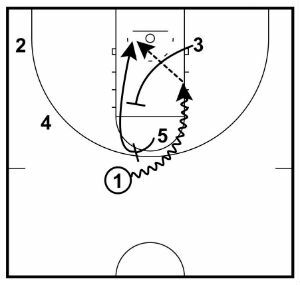 Setup: The play starts in a 1-2-2 set with the post players on the elbows and the guards in the corners. 1. 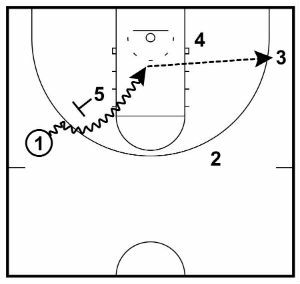 The play begins with 3 cutting up to the wing and receiving the pass from 1. 2. 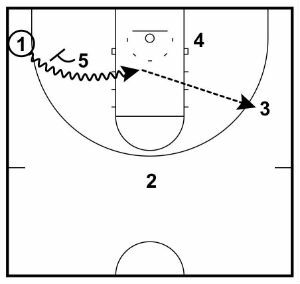 1 UCLA cuts off a screen from 5, and if they don’t receive the pass for the layup, 1 clears out to the ball-side corner. 3. 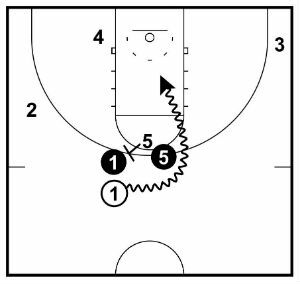 5 sets an on-ball screen for 3 who drives into the lane looking to create. 4. On the weak-side of the floor, 4 down screens for 2 to make the help defense move. 5. 5 rolls to the rim out of the pick-and-roll. 6. 3 now has numerous opportunities and must make the best basketball play. 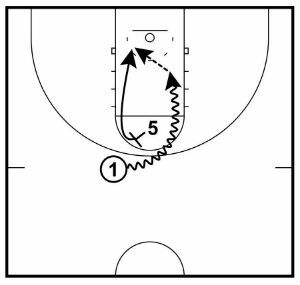 A very simple but effective play that can be used for all levels of basketball. If 2’s defender is on split-line, 4 shouldn’t screen inside the key and congest it with players. 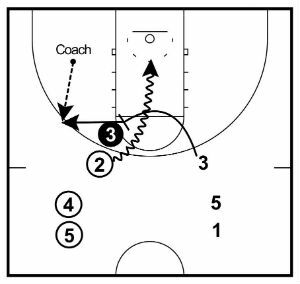 Instead, 2 should simply lift to the wing and will be open for the pass and shot. 5’s on-ball screen must be set at the correct angle to make it effective. Don’t allow the opposition to simply slip under the screen. We’ve talked discussed how to execute the perfect pick and roll, but there’s something important we’re missing. It doesn’t matter how much knowledge you have, if your players aren’t experiencing and practicing the pick and roll regularly it will be difficult to be effective during games. The drill starts with 2 players on offense and 2 on defense. The offensive team will attempt to score out of the pick and roll while the defense will attempt to get a stop without switching on defense. 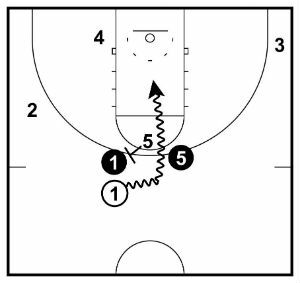 This drill works the basics of both pick and roll offense and pick and roll defense. An offensive and defensive player on the wing. An offensive and defensive player on the low block. The rest of the players wait on the baseline. The offensive player on the wing starts with the basketball. 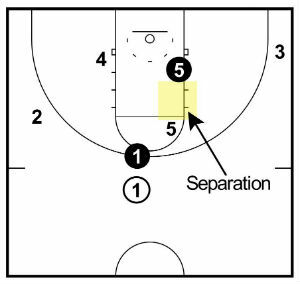 • The offensive team must stay within the quarter of the court. Crossing the split line is out of bounds. • The offensive team must start each possession with a pick and roll. • The defensive team is not allowed to switch. 1. The drill begins with the offensive player on the low post sprinting out to set a screen. 2. The offensive player with the basketball must use the screen and attempt to create a scoring opportunity. 3. The defense can defend the pick and roll any way they want, but they must not switch. 4. If the offensive team scores, they stay in and the defenders rotate. If the defensive team gets a stop, they become the offense and new defenders must come in. 5. 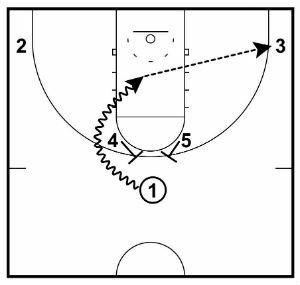 Continue this drill for a set amount of time. Change the Screen Location – You can also have the players set the screen at the top of the key or on the opposite wing. You must talk with your players before starting about how to set a screen. Make contact, correct angle, etc. Make sure all your players practice being both the ball-handler and screener. We need to create positionless players! Coach your players on making the right read off the pick and roll. Eg. If the defender goes under, shoot. If they go over, attack. Puts the dribbler in an advantageous position because there’s no help by the screener’s defender. The dribbler makes a read and should get an open look most of the time. 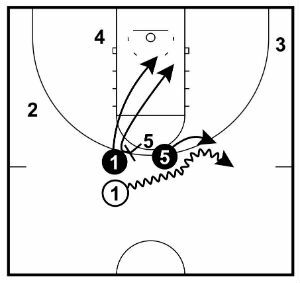 Then the screener pops out and receives a second ball from a coach for a jump shot. By giving the dribbler a large advantage they are able to learn the basics of how to use a screen with a high success rate. Also, the screener works on popping out for a jump shot. Two lines: A dribbling line (with a basketball) and a screening line. One coach with a basketball. 1. The on-ball defender begins the drill by playing defense on the players dribbling the basketball. 2. 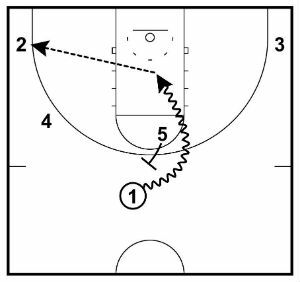 The screener sprints over from their line and sets an on-ball screen. 3. The dribbler uses the screen and makes a read on whether they should attack the basket, pull up for a jump shot, step back for a shot, or not use the screen at all. They shoot the basketball. 4. 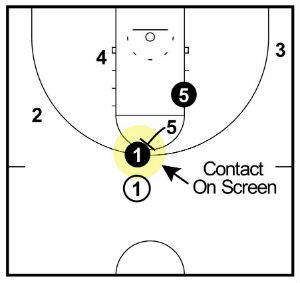 Once the screener has set the screen they pop out to receive a second basketball from the coach and shoot a jump shot. 5. The dribbler becomes the defender, the defender joins the end of the screening line, and the screener joins the end of the dribbling line. Another Defender – You can progress to add the screener’s defender and then play two on two. This means the coach won’t pass the ball to the screener for the outside shot. Screen Other Direction – Make sure your players practice coming off the screen with both their left and right hand. The screen must be set at the proper angle that doesn’t allow the defender to easily slip under the screen. The dribbler must explode shoulder to shoulder with the player setting the screen so that they can’t easily get through. The screener must hold the screen until the dribbler has used it. Don’t allow them to pop out too early. The dribbler also can’t use the screen too early or it will be an offensive foul. They must wait until the screen is set. As I was finishing up writing this article, it occurred to me that there were still a lot of pick and roll tips that I wanted to share with you that didn’t fit into any of the sections above. Below are 5 extra pick and roll tips which will help you implement it into your system and could possibly spark a few ideas for your in-game coaching decisions. Don’t limit your players to being either a dribbler or a screener exclusively depending on their size and position. Every player on your team should be practicing both roles. Your post players must practice being the ball-handler. Your guards must practice being the screener. Being able to play positionless basketball is incredibly important for all players and that trend will increase even more in the future. While your players will be practicing both positions, not all coaches will take the initiative to do this. Since most guards don’t practice playing the help position on pick and rolls, they often get very confused and make mistakes when you put them in this position during games. This can lead to a lot of easy scoring opportunities for the offense. Also, point guards often set the toughest screens! If the defense decides to trap the pick and roll with both defenders, the dribbler should take two long retreat dribbles to create space between them and the screener. The screener will make a short roll approximately a step closer to the rim and get ready to receive the basketball. From here, the ball-hander can make the pass screener who will have a lot of space and can shoot the open shot or attack the rim 4-on-3 and make a play. The pick and roll puts the two defenders involved at a big disadvantage if a solid screen is set. The other three defenders will be forced to rotate towards the basketball to prevent a pass to the screener or an easy layup in the paint for the ball-handler. This will often leave at least one of the other three offensive players playing off the ball open. These players must be down and ready to catch and shoot or catch and drive the basketball. If you’re playing against a team with a great rim protector, have the player they’re defending step out to set the screen. Doing so will drag the rim protector away from the rim and forces them to play defense on the perimeter opening up the paint. There are far too many coaches teaching the pick and roll incorrectly or leaving out important details. As it’s the most common action in basketball, it’s crucial you’re breaking down and teaching your players everything they need to know to run it effectively. That knowledge will not only assist them as they compete on your team, but also assist them if they choose to pursue basketball at the next level.